This topic contains 20 replies, has 12 voices, and was last updated by Colby Chute 10 months, 3 weeks ago. Alright, thank you for the advices. 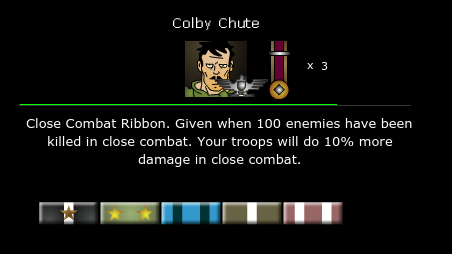 I have a ribbon called the Close Combat Ribbon, you get it when you kill 100 enemies in CQC. Your troops get a 10% damage increase in CQC. Could you please post a picture of that ribbon here for all to see? Nobody had done that yet so you be the first. CQC Ribbon? Time to have a squad of Commandos! The CQC ribbon is on the far right. This URL should work. Once again the ribbon is on the far right.